Over this last year, TrendPo has been completely immersed in all things social media advertising. We’ve kept up with all the algorithm changes, the panic attacks, and the break-ups. Through it all, we continued doing our very best to optimize our clients’ ad spends, building relevant, long-lasting communities within their social media budgets. I’m very proud of everything we’ve accomplished, going from an accelerator startup to the emerging small business we are today. Increasingly, however, just keeping up with algorithm changes isn’t enough. In the post-IPO world, staying relevant to your consumers also includes reading the tea leaves of Facebook’s and Twitter’s business strategies. As TrendPo continues to face the same challenges you do, I’m going to begin posting our findings here. Just like you, we’re doing our best to stay abreast of the constant changes in the social media world. Some may be true, some may be false, some may be theories, and some may be fun conspiracies. Through it all, I promise to be transparent about whatever strategies we’re testing. We’ll use our very own TrendPo tools and dashboards to find the most effective social media optimization channels, and convert as many sales as we can. Along the way, I may also add in a sprinkling of my own thoughts and reflections. It will be a wild journey —— and maybe at the end of all this, I’ll get to meet Mark Zuckerberg. I bet he’s not half as crazy as Gary Busey. At TrendPo we’re keeping up with the latest social media trends just as much as we are with politicians. One new development in the ever-changing social media landscape is Facebook’s recent update to its EdgeRank news feed algorithm. The modification prioritizes posts in your news feed based on relevancy, timeliness, and engagement–and it’s having a direct impact on what posts users see in their desktop and mobile news feeds. While Facebook has described the change as an effort to deliver better content to its approximately 1.26 billion users, many see the algorithm modification as a way to boost Facebook ad sales. The social networking site has been mum on how the algorithm works, but based on our research it seems published news sources will have more news feed exposure than one-time, viral posts. And sources that a user interacts with frequently are more likely to appear in his or her news feed than posts that go “viral” just because they are popular. For example, if you’re an avid reader of The New Yorker and often “like” or engage with the content the online mag serves up on Facebook, The New Yorker’s posts will be more likely to appear in your news feed. In short, Facebook fancies itself a personal curator of the content it believes users will find the most interesting and newsworthy. What does this mean for businesses that use Facebook Pages? Facebook wants to keep users on Facebook “real estate” as long possible so changing their EdgeRank rewards content creators on the Facebook platform and punishes posts that send users out to other websites. Quality over quantity – Now, more than ever, it’s important to understand your audience and what content resonates most with users. Analyzing which posts are popular with audiences is critical. News feed Ads – It will be important for organizations and companies to invest more in news feed ads in order to reach their audiences. More content creation – Companies that advertise or have use branded Pages are going to have to create more content than before to reach their audiences—and be smarter about the likes and interests of their followers when creating new content. Get the conversation started – Strategies like encouraging community conversations on Facebook and posting compelling images to keep their audiences engaged will help organizations stay relevant. If you’re thinking about increasing your Facebook ad spend to keep up with the competition—make sure your ads are targeted to the audiences you want to reach and engage. TrendPo’s SocialEdge platform provides you with a list of highly qualified, scored leads for Facebook. TrendPo uses its Rank and Benchmark data to identify leads that perform better and cost less than traditional Facebook ads. Facebook uses general demographics to target ads, but TrendPo’s customized lists have been filtered to identify the most engaged Facebook users that align with your organizations’ brand or interests. That means your social ads dollars aren’t wasted and your Facebook ads are more effective at generating leads. For more information of TrendPo SocialEdge and more, visit us here or sign up for a free demo. 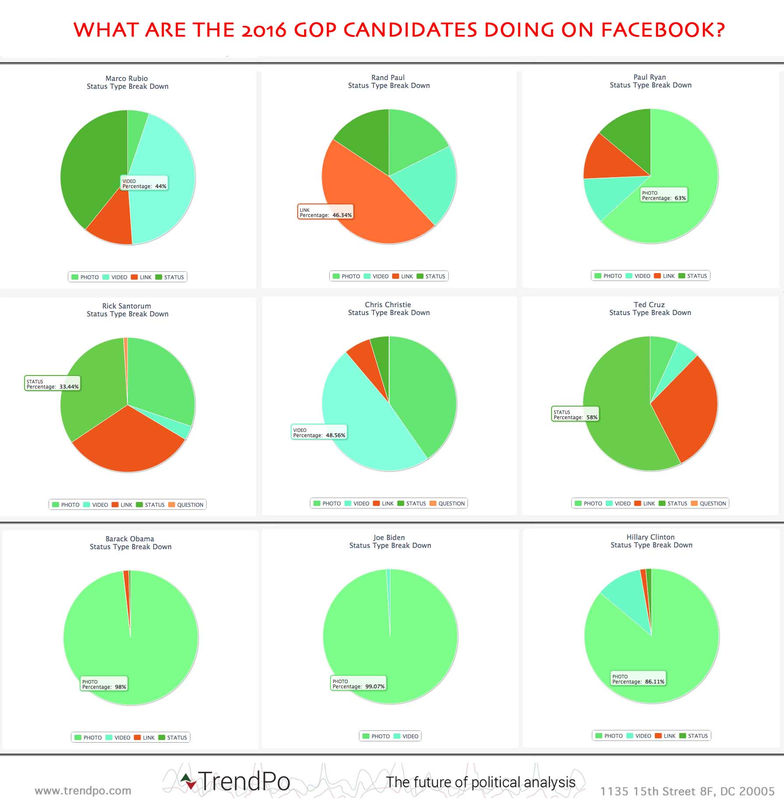 Looking at Facebook data since November of last year, we found that potential 2016 GOP presidential candidates are pushing out a variety of content on the social networking site—some are predominately sharing videos or statuses, while others are more often posting links or photos. But each GOP lawmaker has his own style—and no two are alike. By contrast, top Democrats have a clear strategy for Facebook engagement. To them, a picture is worth a thousand words. Data shows that they favor posting photos on Facebook more than any other type of content. A version of this chart was featured in U.S. News and World Report earlier this week. Every Monday, U.S. News and WorldReport’s “Washington Whispers” blog will feature a piece of Trendpo’s data on the political social media landscape. Vice President Joe Biden and former Secretary of State Hillary Clinton—both of whom top the list for 2016 Democratic ticket– are following President Obama’s shoes. And it’s no secret that Obama has used social media more effectively than any politician in the last two presidential campaigns, so are Biden and Clinton on to his strategy? Recently re-elected New Jersey Governor Chris Christie primarily posts videos. And this is probably very intentional—Christie’s no-nonsense approach has bolstered his national presence giving him credibility on both sides of the aisle; he’s taking advantage of the fact that his style resonates best on video. For Ted Cruz, the vast majority of his content features statuses and links, though he uses a variety of different mediums and this strategy seems to be working for him. 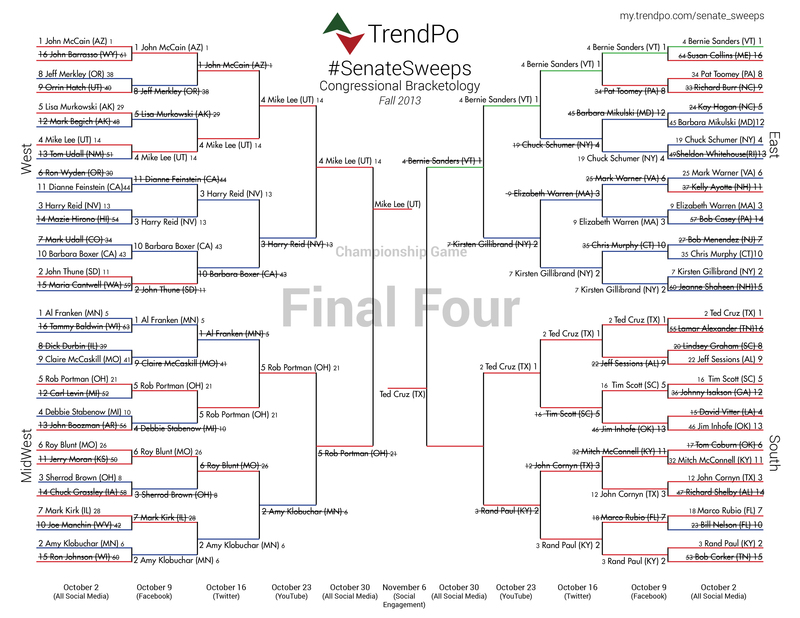 He’s survived to the final rounds of TrendPo’s social media competition, #SenateSweeps. He’s best known for his efforts to repeal Obamacare and the recent posts on his Facebook page reiterate his message. 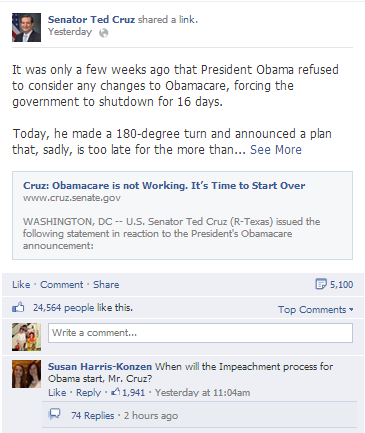 This post was shared 5,100 times and Liked by over 24,000 times–Cruz’s messaging strategy is resonating with his Facebook audience. Sixty-three percent of Representative Paul Ryan’s Facebook posts are photos, whereas Florida Senator Marco Rubio uses the least amount of photos of any of the possible GOP front runners. Lately, Paul has been more ‘talked about’ on Facebook than any of his Republican colleagues due to budget discussions in Congress–and his photo-centric approach is getting him a lot of buzz on the social network. Once these potential candidates are in campaign mode, will their Facebook content feature more photos and videos? We’ll be watching the data to see if their social media strategies change over time. We’ve reached the finals, and our two remaining contenders have been together since the beginning. Of the four Senators, Bernie Sanders came in second overall last week, but couldn’t match the social media powerhouse that is Ted Cruz. Sanders tweeted 60 times last week, but his very active week on Twitter only garnered 772 new Twitter followers. Meanwhile Ted Cruz proved his online presence is well-established–he tweeted 12 times and gained over 3,300 new followers. And Rob Portman, despite being a strong contender in the Midwest, was outmatched by Lee’s strong showing on Facebook and YouTube. Mike Lee owes much of his prominence to his affiliation with Ted Cruz; the two work together at the Senate Conservative Fund, a PAC promoting conservative Republicans. 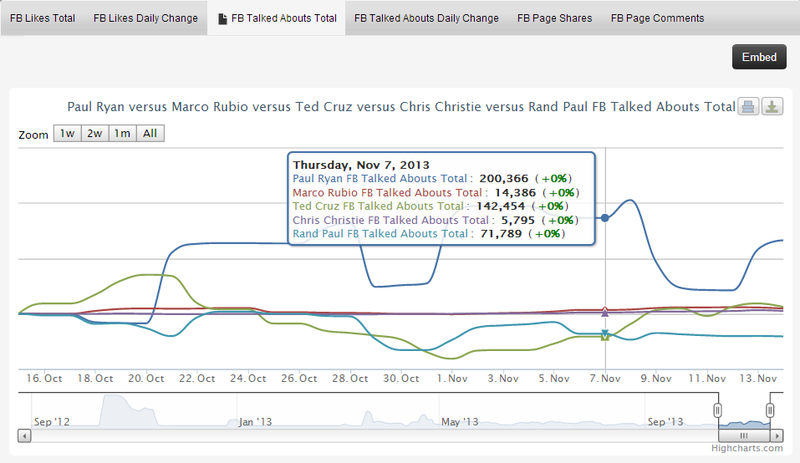 Cruz has a significantly stronger social media presence – he dwarfs Lee in followers and likes. However, the final round of #SenateSweeps is the social engagement round, looking at how Senators are actually interacting with their constituents. Metrics we’ll be looking at include Comments, Retweets, and Shares. Can Mike Lee squeak out a victory on the back of more active engagement? We’ll announce the champ of #SenateSweeps later this week. 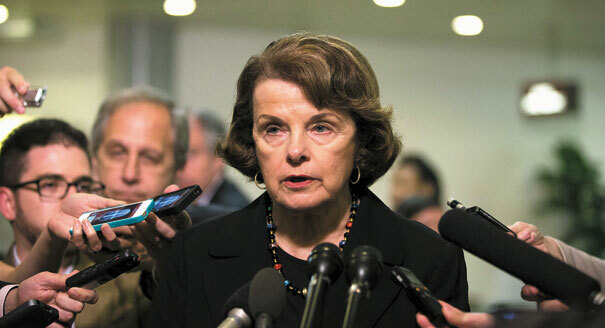 Senator Dianne Feinstein has been one of the strongest supporters of the NSA’s surveillance activities. But when news broke of U.S. spying on the country’s allies, she changed her tune. In a statement this week, Feinstein condemned spying on America’s allies. She said she was “totally opposed” to such efforts and concerned that President Obama did not know about them until recently. The California Senator also released an NSA “reform” bill Thursday. Feinstein claims the measure would increase privacy protections and congressional oversight of the program, but preserve activities she deemed vital to preventing terrorist attacks. The NSA story and the woes of the Obamacare exchange website have been competing for national news coverage all week. Earlier in the week, Feinstein was even outpacing coverage on the Affordable Care Act. It’s rare that one of Obama’s staunchest allies would take a stance against the Administration, and as a result she’s seen quite a bit of media coverage on the issue. But she hasn’t taken to social channels to advocate her cause. This could be a missed opportunity for Feinstein. She has not posted to her Facebook or Twitter accounts which means that her position on the NSA surveillance program has been overlooked on social media–simultaneously, her national media coverage has been on the decline since Wednesday. 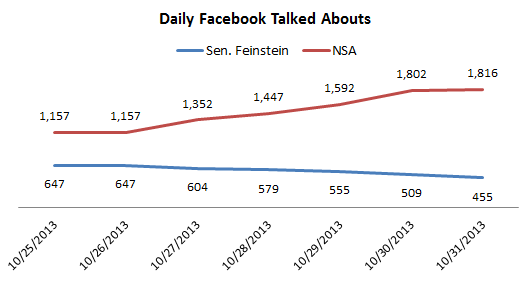 While the National Security Agency has seen an increase in Facebook Talked Abouts everyday this week, Feinstein’s Talked Abouts have been declining. One of the most common ways lawmakers extend media coverage is by taking to social media to fuel support and discussion on the issues they are championing. Of course Feinstein is a veteran Senator with a reputation for being outspoken on issues she cares about even when she’s at odds with fellow Democrats. But by neglecting to use social media channels to champion her position on NSA snooping, she isn’t maximizing her online influence–especially compared to other Senators. A staunch proponent of increasing gun control, Feinstein’s assault weapons ban lost in the Senate in September and she blamed the Senate for shirking it’s responsibility. We’ll be watching to see whether she uses ramps up her social media this time around to drum up public support for reigning in the NSA. Click image to visit our channel.